Many users were genuinely impressed by the high level of comfort this mid-cut boot provides. Consumers adored the Terrex Swift R Mid GTX for its durability. It remained unscathed after a thousand-foot trek, according to one impressed owner. A good number of reviewers raved about how light the Adidas Terrex Swift R Mid GTX boots are, with a few even forgetting that they had them on. Some users were all praises for its excellent grip, thanks to its trademarked Traxion outsole. A number of wearers applauded this hiker for being true to size. The boot only required little break-in time, based on a handful of customers. A few owners were ecstatic to know that the Swift R Mid GTX is vegan. One of them even stated that it’s the best vegan footwear to date. Vegan products are made using 100% synthetic materials. They are completely animal-free. A couple of hikers praised its mid-cut design which gave sufficient stability while on the move. One expert was deeply amazed by how well rounded these boots are, that finding a single fault about it was just impossible. A number of users found the Terrex Swift R Mid GTX too narrow for their feet. A few wearers were disappointed with its lace buckles for coming off too easily. A couple of reviewers disappointingly remarked that the Adidas Terrex Swift R Mid GTX is not waterproof, but only water repellent. The Adidas Terrex Swift R Mid GTX is a lightweight, premium day hiking boot that oozes with comfort right out of the box. This vegan hiker provides more while demanding less, thanks to its snug-fit design, grippy outsole, and little-to-no break-in time. It’s not just widely praised for being well rounded, true to size, and sturdy, but also for providing hikers great stability. Some users, however, were not too happy about its narrow width, lace buckles, and hit-or-miss waterproofing feature. A really nice, lightweight boot--super comfortable right out of the box. 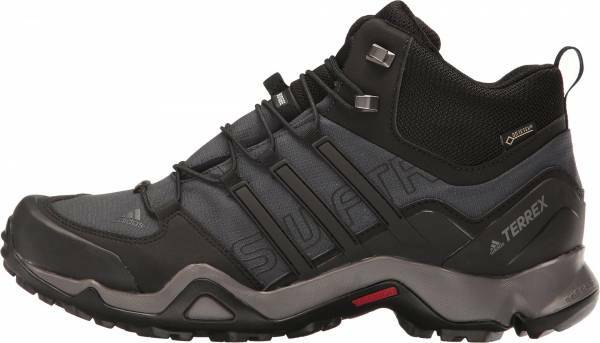 The Adidas Terrex Swift R Mid GTX is a sturdy, lightweight hiking boot that is built for rugged terrain. The waterproofness of the upper primarily comes from its Gore-Tex lining. Its debris-resistance is provided by its gusseted tongue. The boot also has a hardy, one-piece midsole and protective, rubber toe rand. The Combi lacing system consists of hook eyelets and lace bungees. This system provides firmer foot support and promotes movement confidence. The entire upper is made of ripstop mesh. This material gives breathable and lightweight comfort. The boot has TPU overlays that provide durability and additional support. The boot’s forefoot-to-toe profile is also slightly angled. It makes transitioning from midstance to toe-off much easier and feel more natural. The Terrex Swift R Mid GTX is a day hiking boot for men and women. The men’s version comes in sizes 7.5 through 15, with half sizes available until 11.5. The women’s version, on the other hand, comes in whole and half sizes from 6.5 through 10.5. It is offered in medium width. Its snug-fit comfort comes mainly from the improved lacing system which features extra hook eyelets that provide better ankle support. The heel collar and gusseted tongue are extra cushy and have enough padding to provide comfort. Traxion, Adidas’ answer to slippery surfaces, is the technology behind the Terrex Swift R Mid GTX’s grippy outsole. The majority of the boot’s underside is strategically peppered with low-profile, multi-directional lugs that provide enough traction on both off-trail and urban surfaces. Also, the outsole’s heel zone aids the user in tackling downward slopes with its aggressive, diagonal tread pattern. The single-build, EVA midsole outlines the boot and gives it sufficient resistance and rebound upon ground contact. It provides comfort and is responsible for shock absorption. It also works with the Adidas Adiprene technology—a highly shock absorbent and durable foam material which is embedded in the midsole. It has a removable footbed. It can be replaced with the orthotic insert preferred by the Terrex Swift R Mid GTX wearer. With its resilient, lightweight, and abrasion-resistant ripstop mesh upper, the Terrex Swift R Mid GTX makes for a tough yet comfortable boot. Its mid-cut design, hook eyelets and advanced lacing system provide ankle support and improve overall stability. The tongue is gusseted to prevent debris and water from entering the boot. There’s a lace holder on the tongue that hugs the speed laces in place. It also has a pull tab at the back of the heel for easy on and off. The boot is waterproof due to the Gore-Tex lining built into the footwear’s upper. This breathable piece of waterproofing technology also makes it windproof. A protective toe rand is applied to the front end of the upper. This sturdy rubber offers better toe protection and prevents injury. The Traxion technology was first used in select Adidas soccer cleats. The Adidas Terrex Swift R2 Mid GTX succeeds this model.